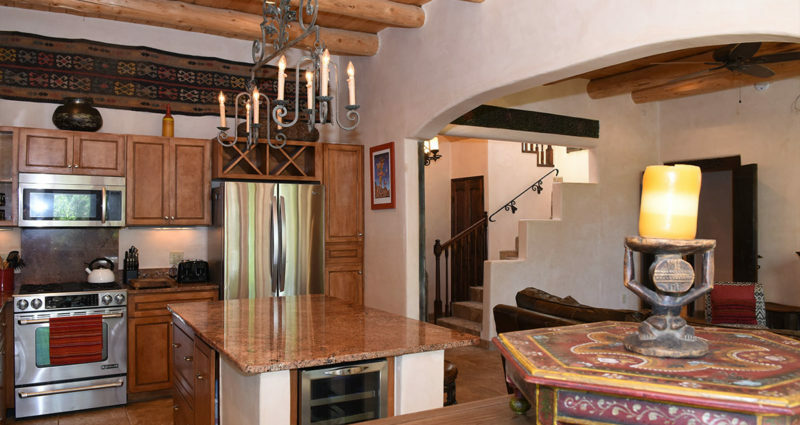 If you’re looking for a luxury vacation rental in Taos, Taos Villa #9 is the answer. 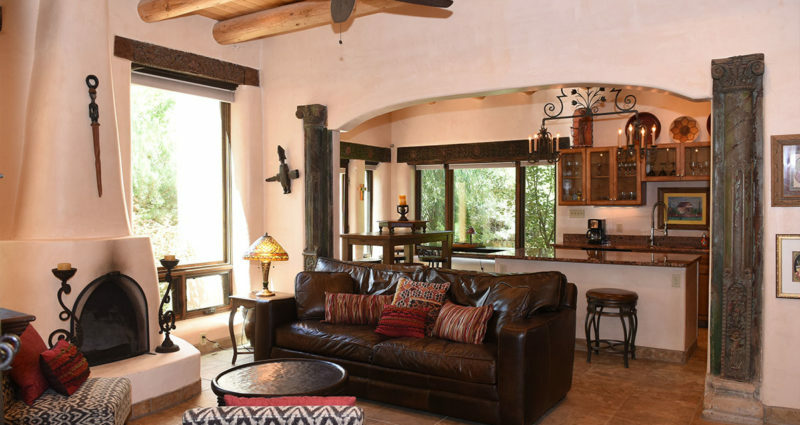 Oftentimes, guests are looking for a vacation rental in Taos that can accommodate a larger group. 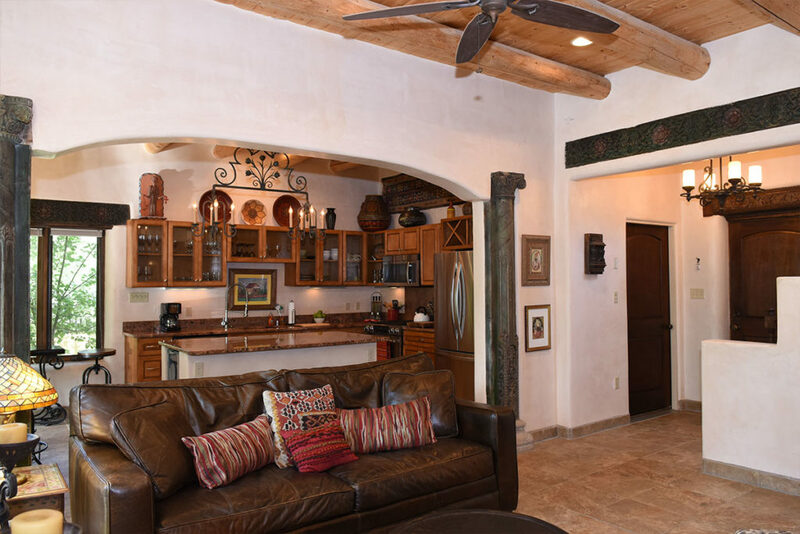 The open floor plan of the two-story, three bedroom / three bath Villa 9 feels extremely spacious, yet cozy and intimate at the same time. 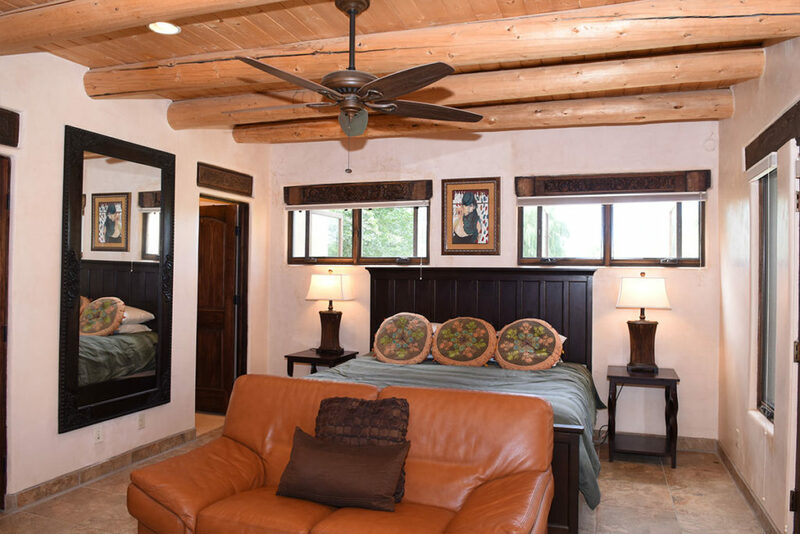 The three bedrooms can accommodate up to six guests. 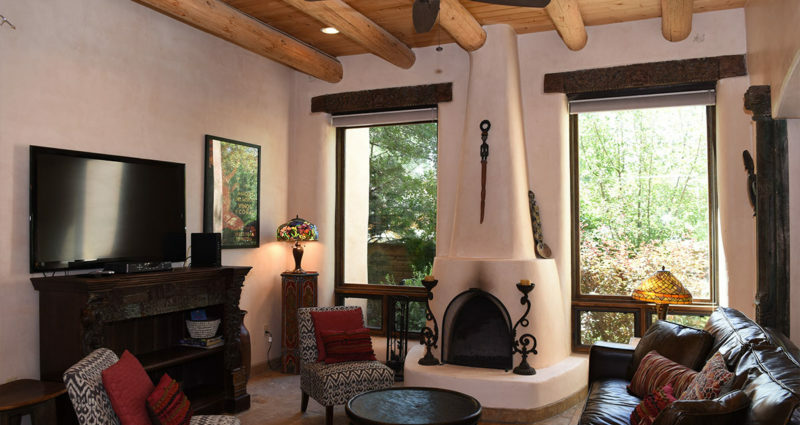 In the living room, with a full-sized leather sofa, two chairs, a bench and a coffee table, you will be able to arrange your furnishings to either gather close to the warming, captivating kiva fireplace (a must-have in any Taos vacation rental property! 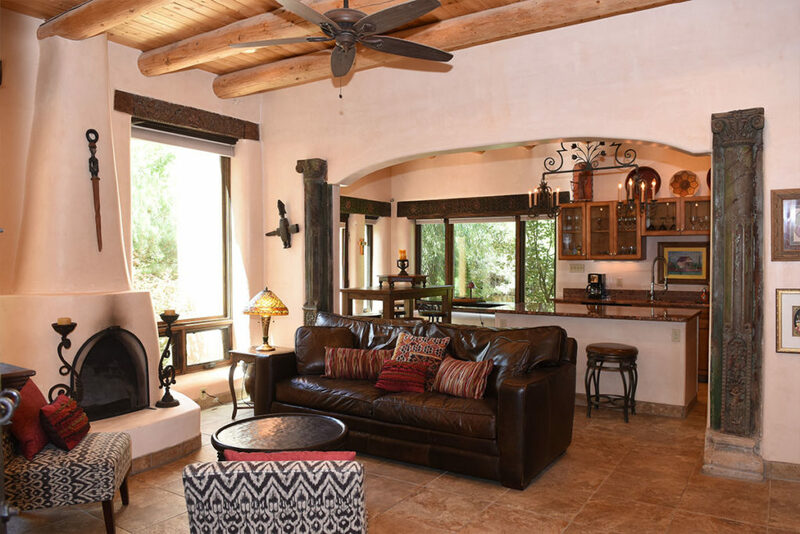 ), spread out to watch the large screen TV, take in the views through the two 7+ foot high windows flanking the fireplace, or socialize with your fellow guests in comfort. 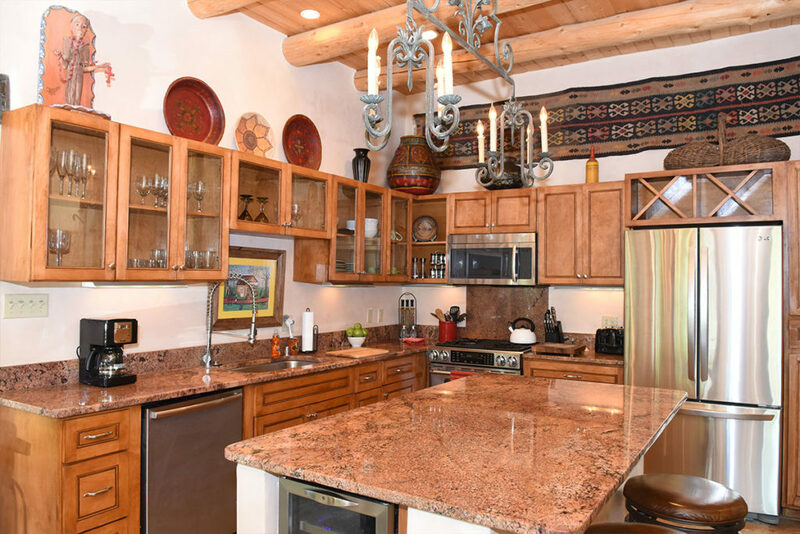 Opening onto the living room is a gourmet kitchen, complete with stainless steel appliances, with a large refrigerator with French doors and lower freezer, a gas oven and stovetop with 4 burners, and a dishwasher comprising the major appliances in the kitchen. 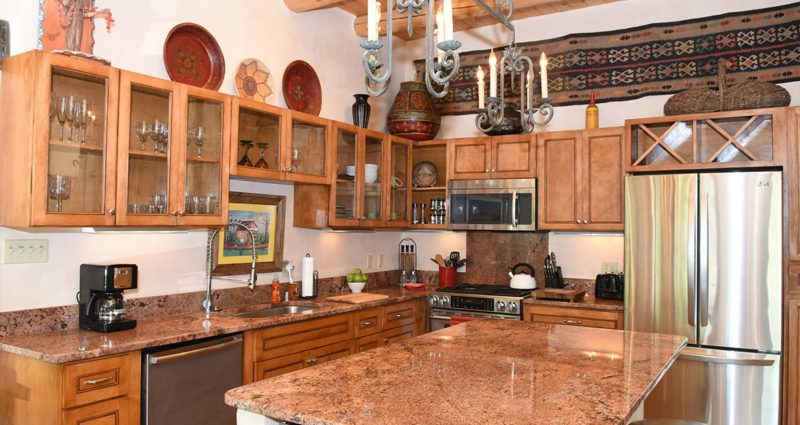 Smaller appliances include a microwave, and even a wine fridge! 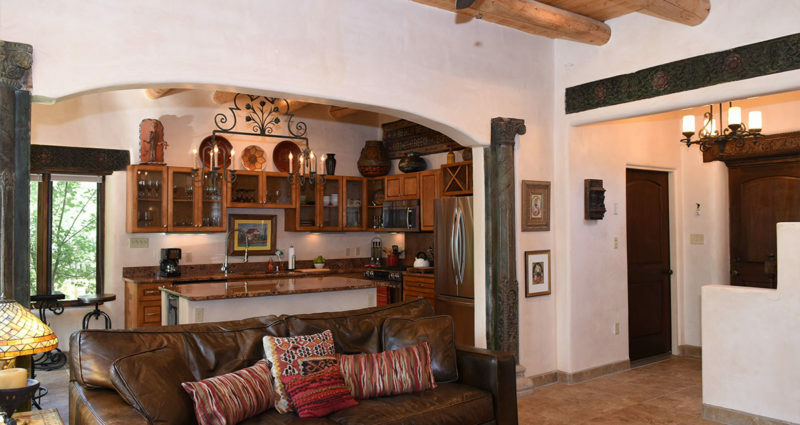 A coffee maker, toaster, blender and other useful appliances and gadgets provide you with the means to whip up your own delicious recipes, should you choose to stay in the comfort of the Villa for some (or all) of your meals. 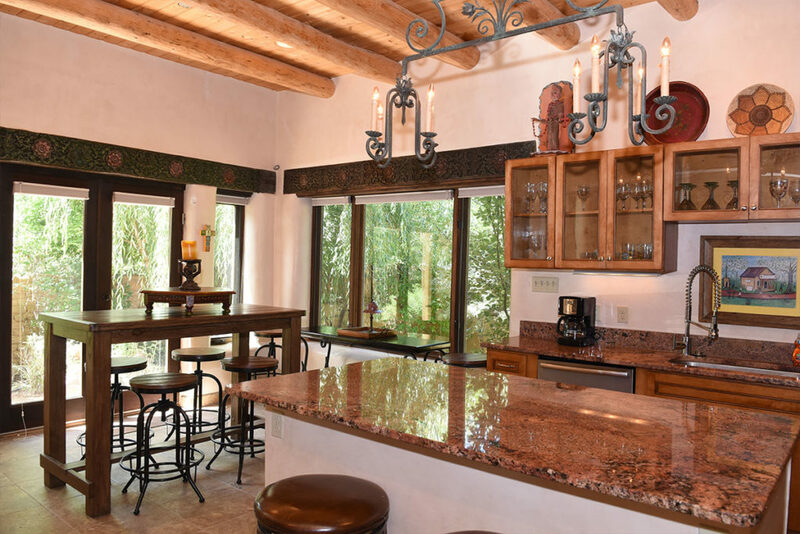 Dishware, glassware, utensils, cookware and serving dishes are all found in abundance. 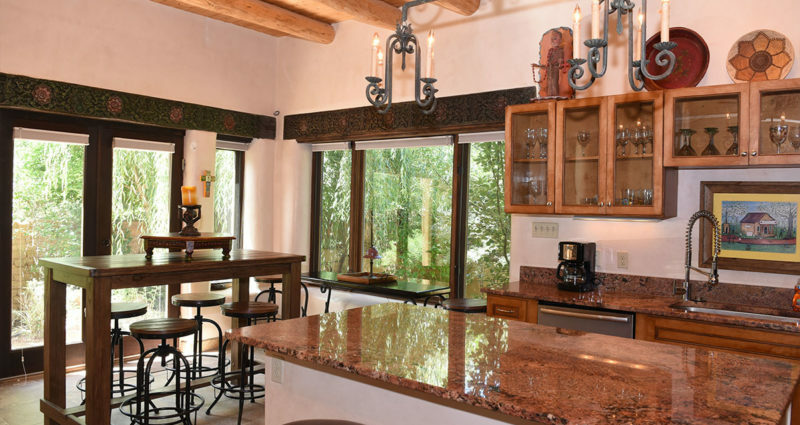 The kitchen features a large, counter-height center island, with two counter-height barstools (these are the perfect seats should you wish to position yourself bridging the living room and the kitchen!). The bar-height dining table has 6 adjustable-height barstools, some of which can be positioned elsewhere in the spacious dining room when not needed. 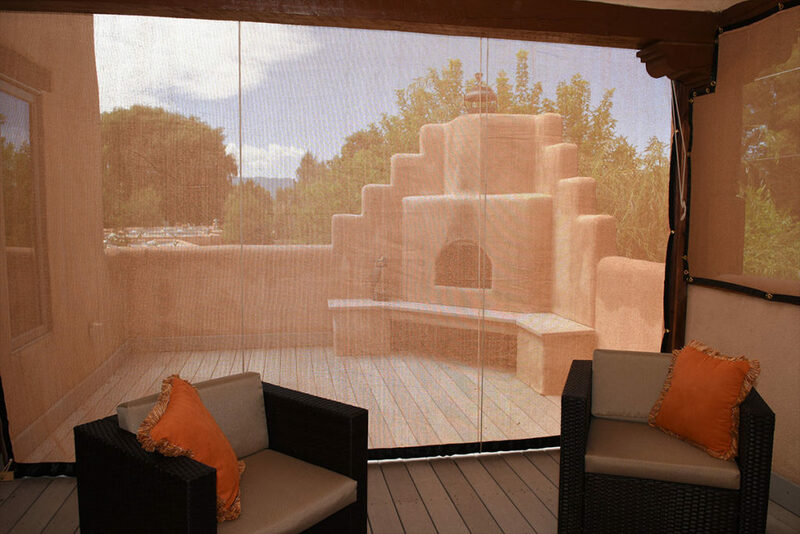 A large bank of windows on one wall of the dining room offers views to the side of the private outdoor patio, and French doors on another wall of the dining room lead you out to the main area of the walled-courtyard, where you will find the propane gas grill (in our opinion, another “must” for a vacation rental property in Taos!) already stocked with propane and grilling tools for your use. 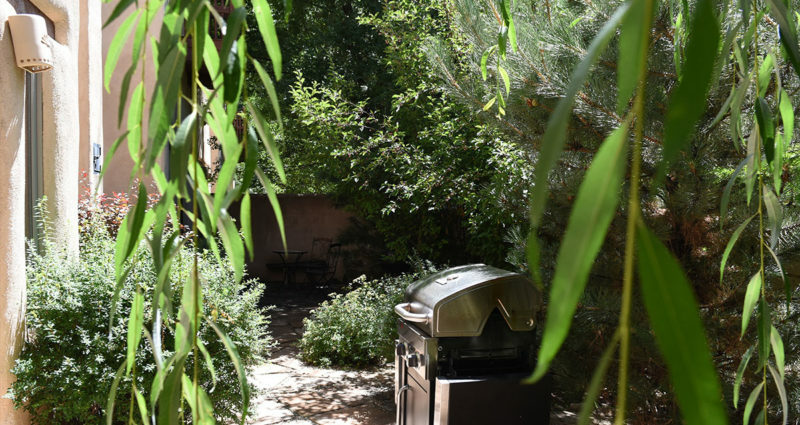 In addition to the gas grill, Villa 9’s private patio courtyard boasts two small seating arrangements. 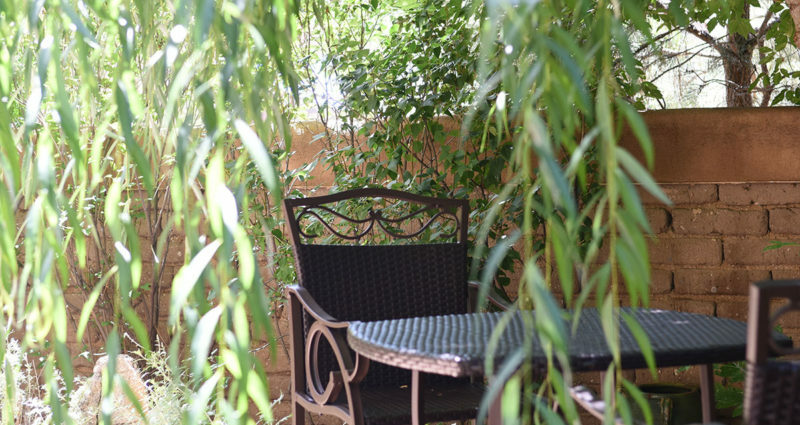 One bar-height table with two barstools sits under a willow tree, so in summer months this can feel like your own oasis in the shade. 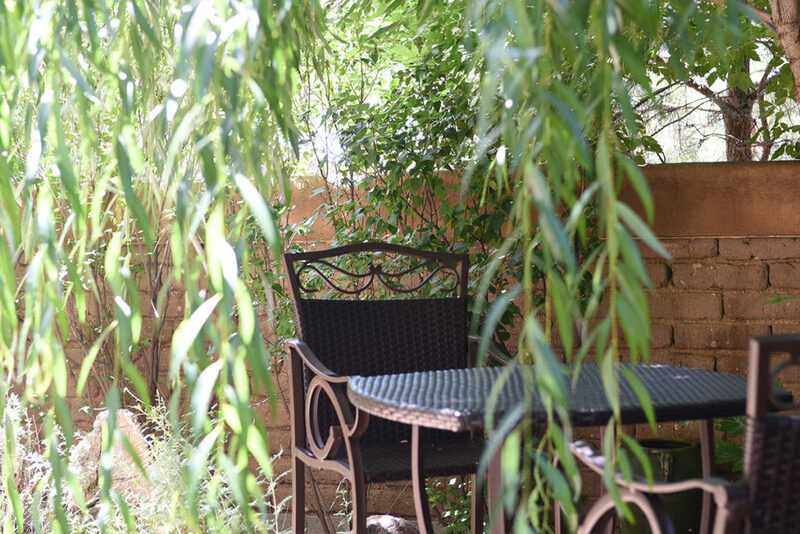 The other seating is at the farther end of the patio (off the downstairs bedroom), and consists of a bistro table and two bistro chairs. 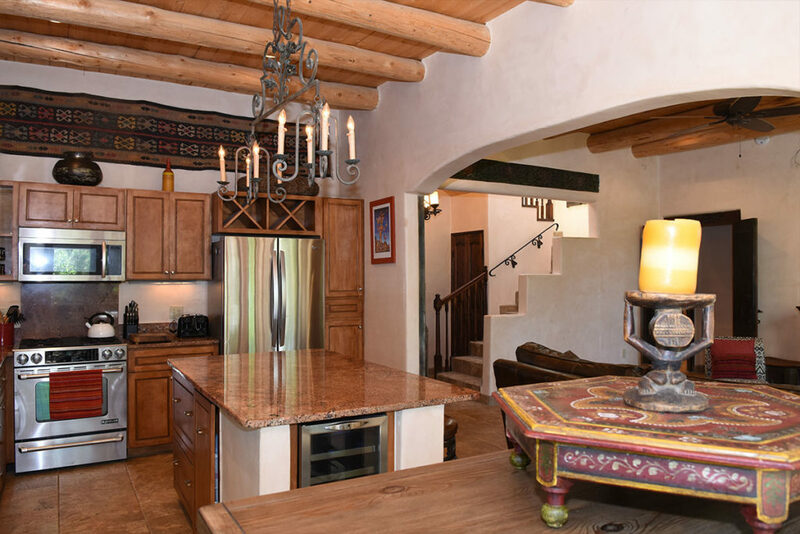 An open staircase leads to the upstairs bedrooms, baths and outdoor areas. A grand skylight and sizable windows in the stairwell enhance the expansive feel of the upstairs landing. 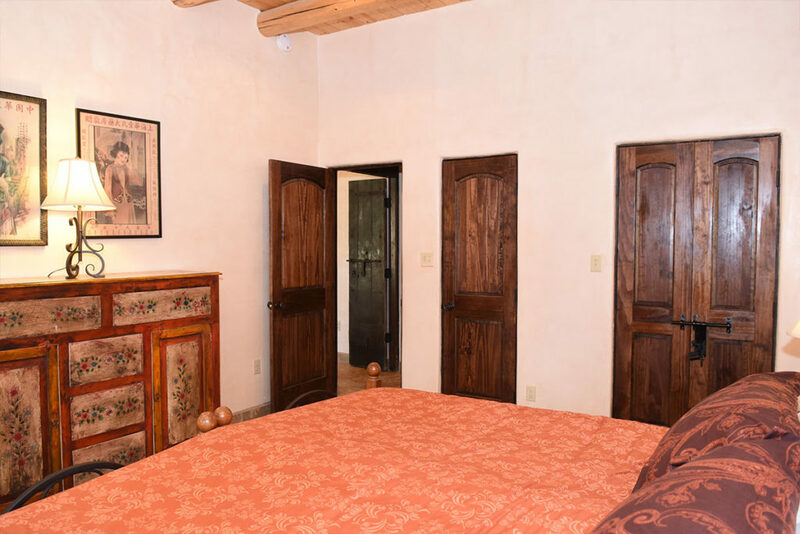 The upstairs Master suite has a King bed, a leather loveseat, and a large-screen television. 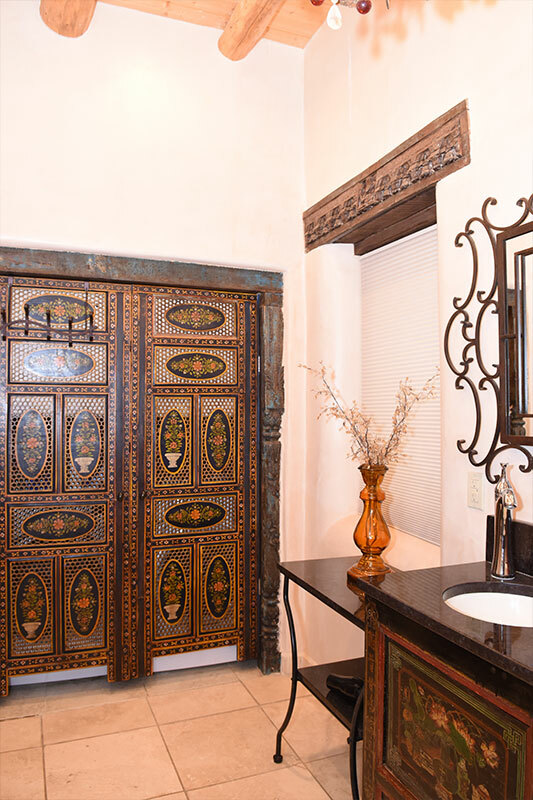 An artful storage piece offers plenty of shelving storage, and there is an enormous closet for additional hanging storage. 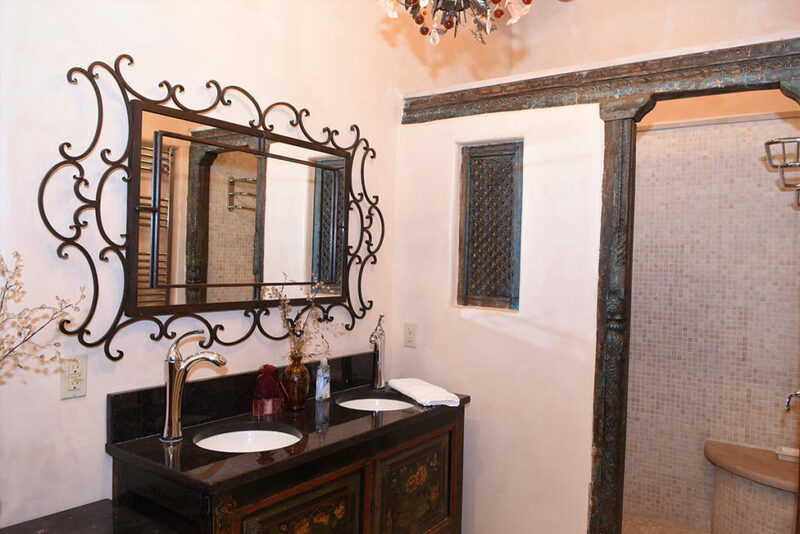 A full-length mirror hangs in the Master suite, and two bedside tables with lamps round out the furnishings. 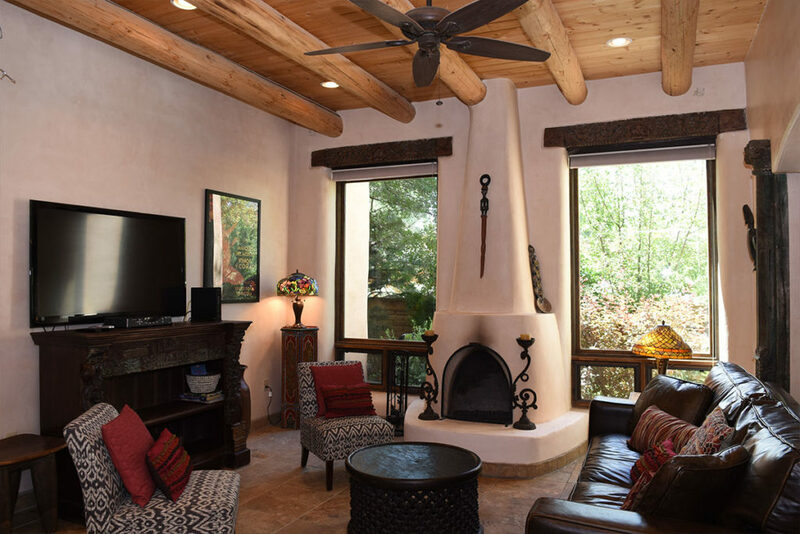 A ceiling fan provides circulating air should you wish to use it. 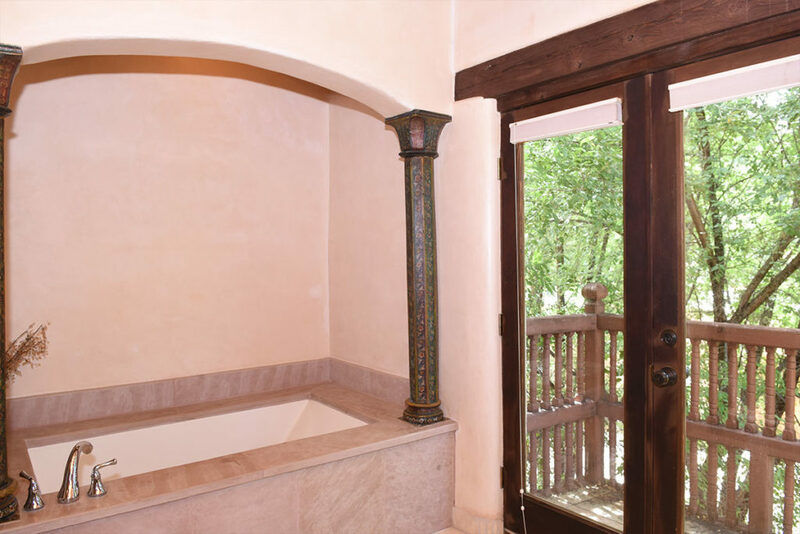 Villa 9’s Mater suite offers an en suite bath, complete with dual sinks, a large soaking tub and a separate shower with built-in bench…. 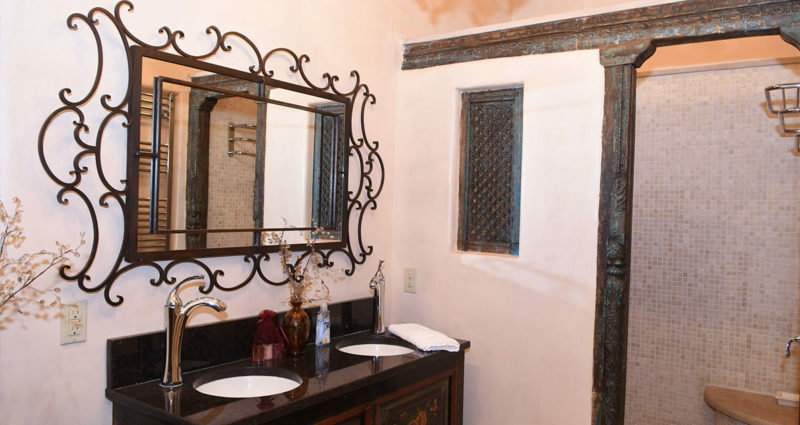 and even a wall-mounted television that you can view from the soaking tub. 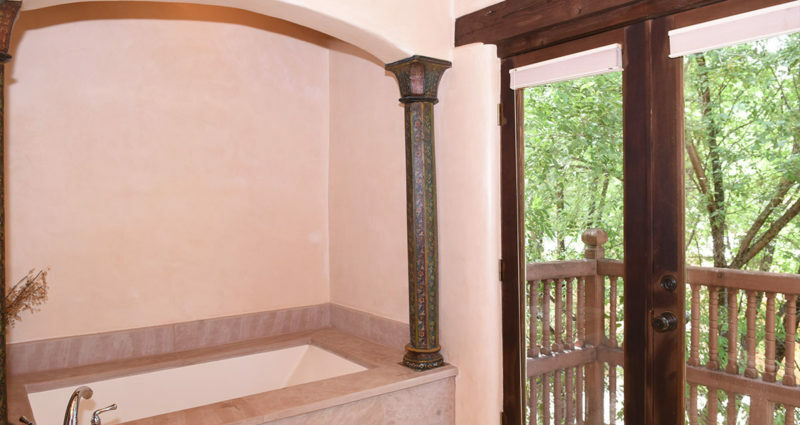 There is also a small balcony off this Master en suite bath. 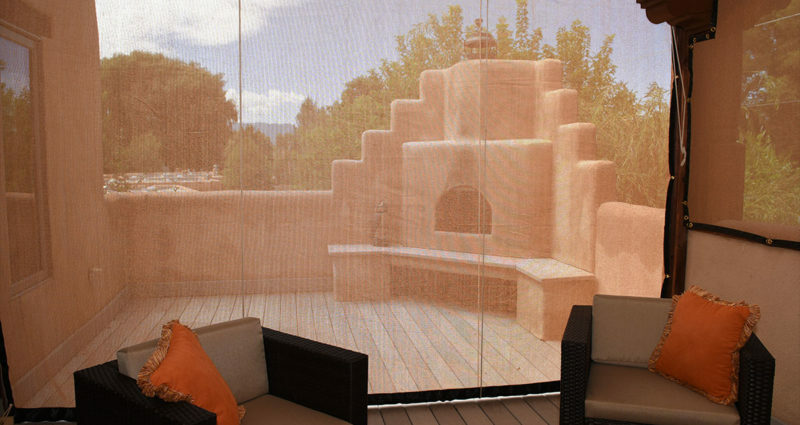 French doors from the Mater suite open onto a sweeping furnished terrace with a kiva fireplace. 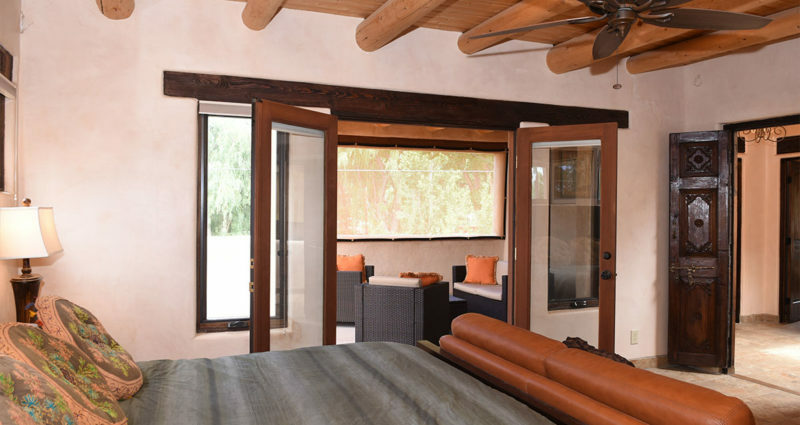 Relax or socialize in the privacy of this outdoor extension of the Master suite, with two chairs, a loveseat and a coffee table. 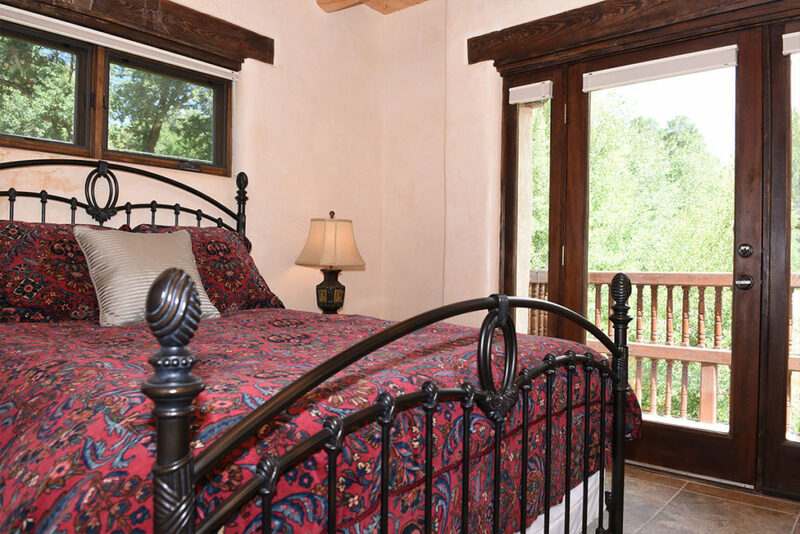 There is a second, smaller upstairs bedroom, with a Queen bed. 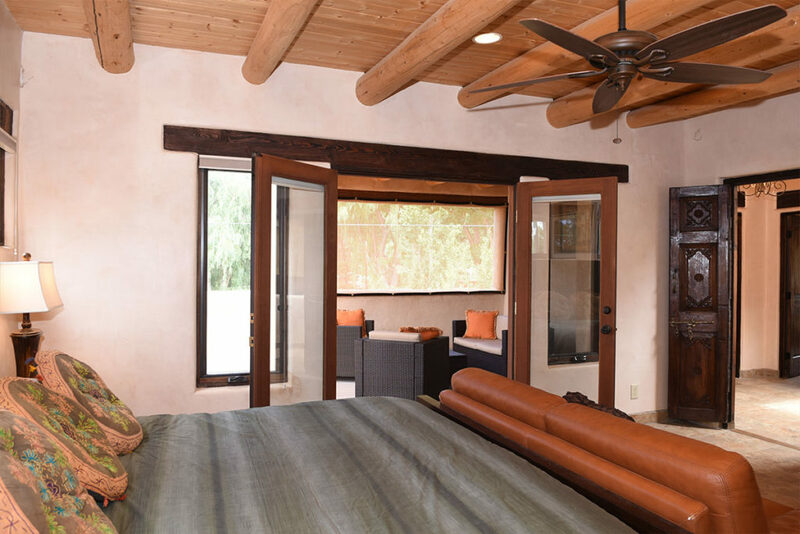 This second bedroom boasts two balconies, bringing plenty of light into the room, and a ceiling fan provides air circulation. 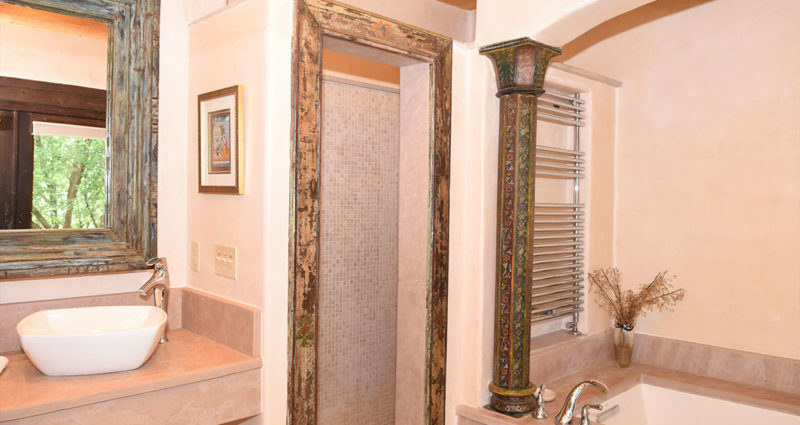 A second upstairs bath with a large walk-in shower rounds out the upstairs floor plan. The third bedroom is located on the ground floor, making it an ideal accommodation for anyone who may have trouble with stairs. 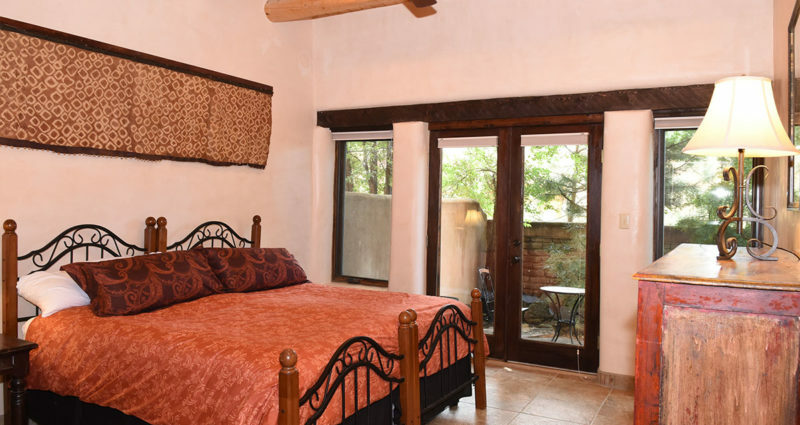 This third bedroom is also unique, in that it has two Twin beds, which can also be joined together to create one King bed… so this bedroom is flexible to accommodate either a couple, or two guests needing separate beds. 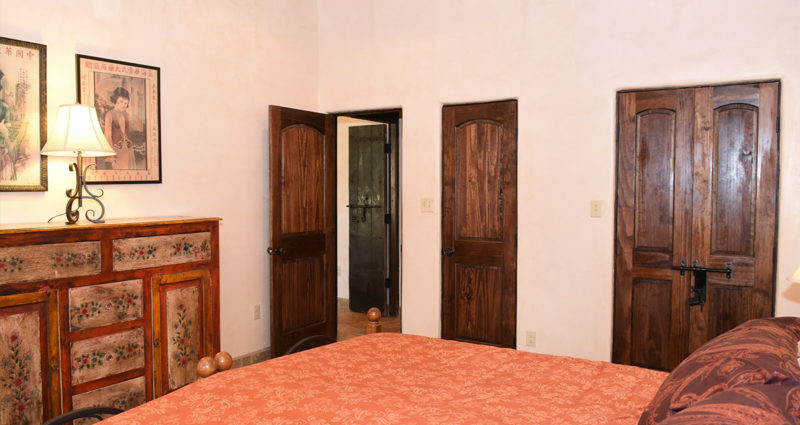 This large third bedroom has French doors leading directly onto the private, walled back courtyard. 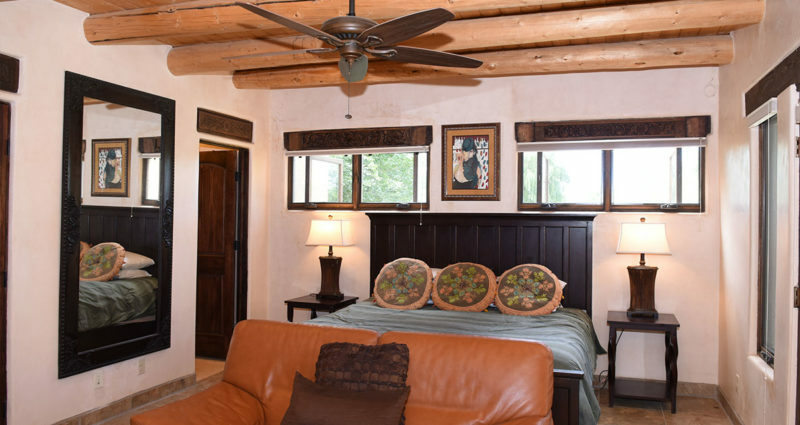 A ceiling fan generates air circulation in this spacious, high-ceilinged room. 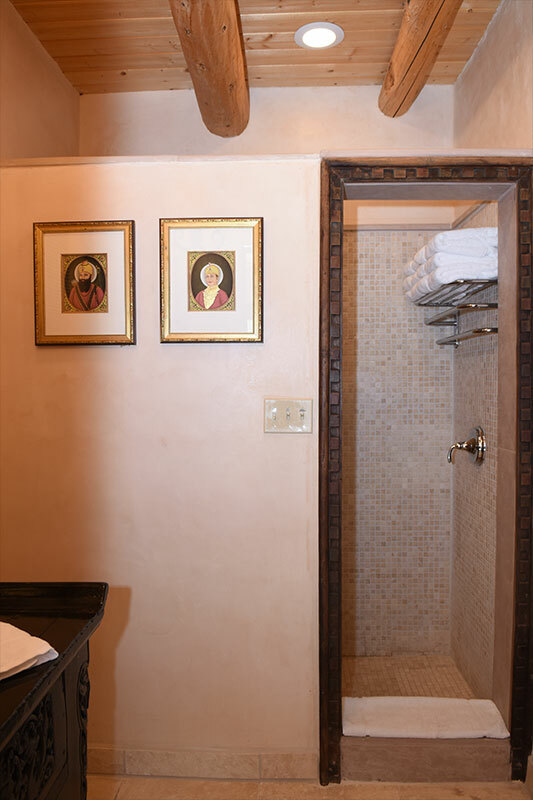 The third bath in Villa 9 is located on the ground floor, across the small hall from the door to the third bedroom (and this hall area can be closed off from the rest of the ground floor, making it a private passageway from bedroom to bath). 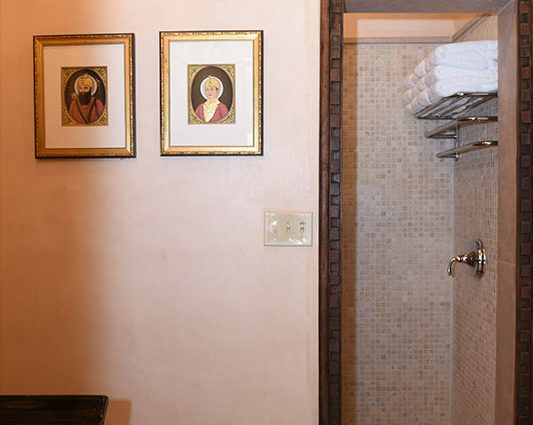 This third bathroom has a large walk-in shower, and a high ceiling. 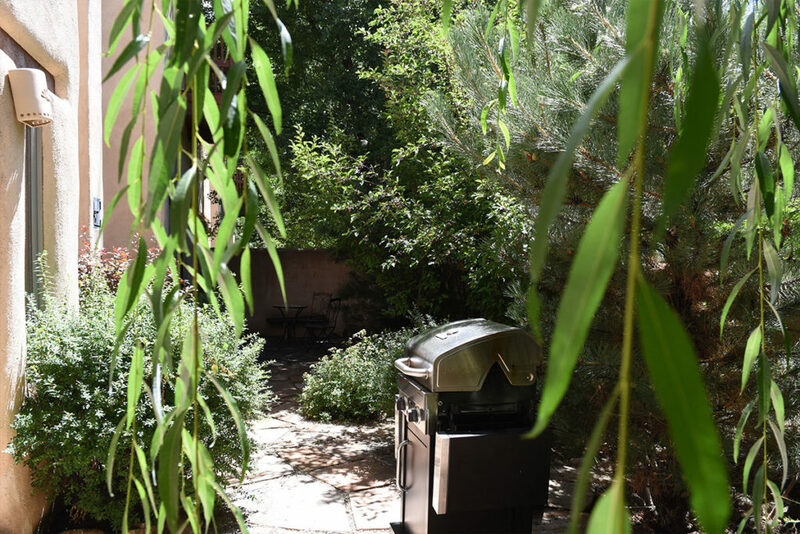 Housed within this third bath is the laundry closet, with a full-sized washer and dryer. 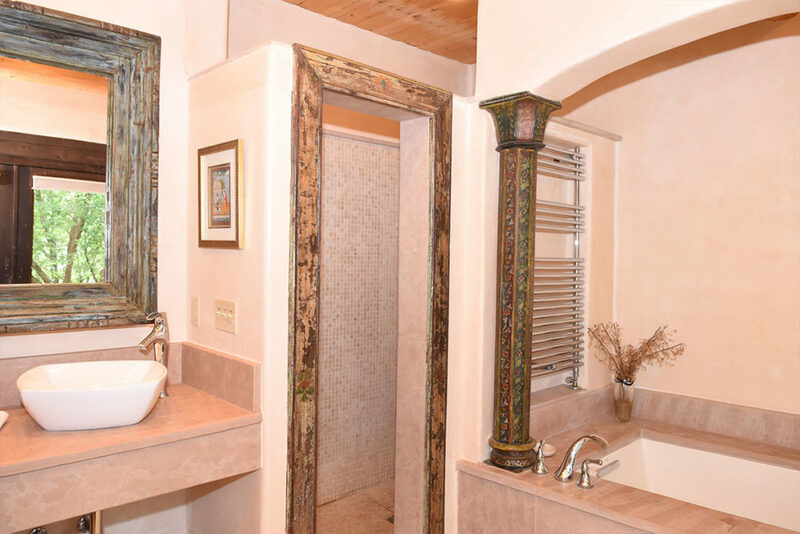 It’s reassuring to know in advance exactly what to expect from your Taos vacation rental accommodations. 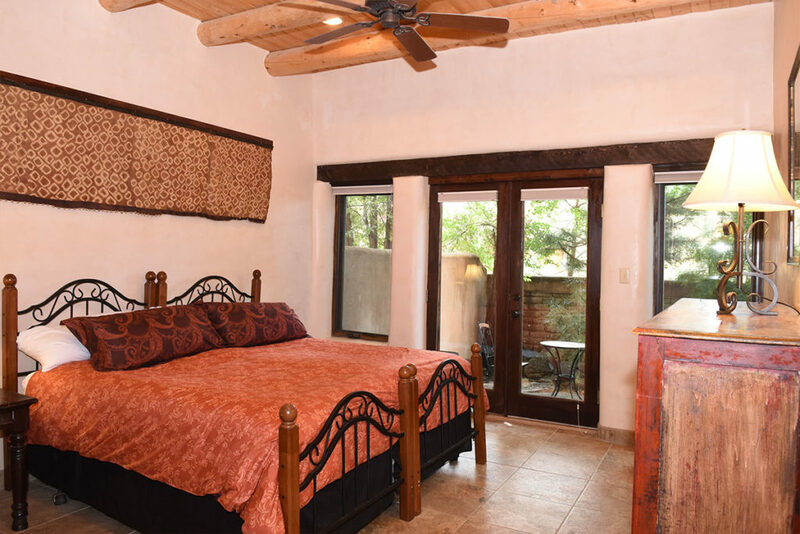 Taos Villa #9 provides you with all the amenities of home…. (and likely so much more! 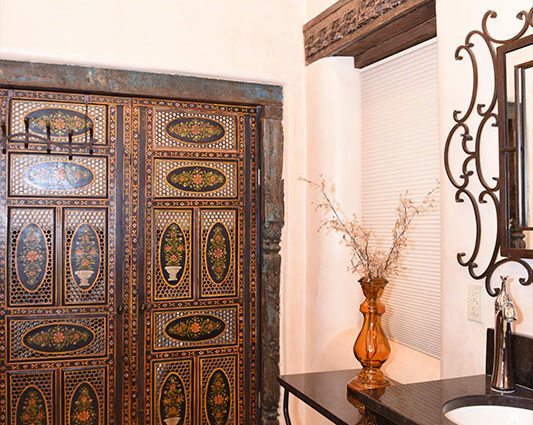 )… in a luxury setting, and an enviable location.